MyPBX is a monthly licensed service which replaces a traditional PBX. That means less upfront cost, allowing you to keep capital expenditure for other business needs. What’s more you can increase or decrease licences as and when you need for simple scalability. MyPBX offers all the advanced features you would expect from a traditional PBX but with some exciting differences. Manage your personal calling profile via our Web Assistant plug in; which can automatically field calls to mobile or voicemail. Remote Office allows you to use your mobile just as you would use your desk phone, dialling other extensions, transferring calls internally and holding 3-way conference calls. With FREE calls between offices and flat rate local and national calls, staff can talk for as long as they like without you feeling the pinch. Unlike traditional PBXs maintenance and changes can be easily managed online, and completed within seconds, not hours. No costs for maintenance agreements, no waiting for technicians. One of the benefits of working with us is our understanding of the system and how it can work to your business needs. We have included the most popular features in our group and standard licences. If there is something that your current system does that isn’t on the list, please let us know and we can find a solution to suit. 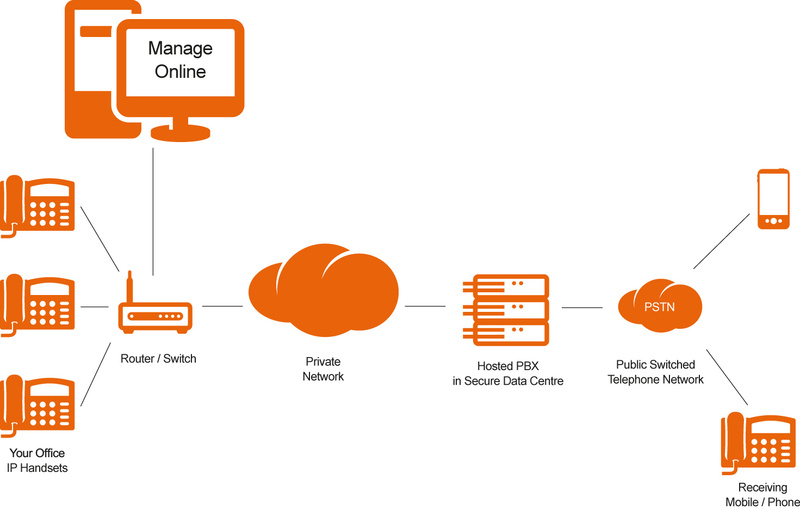 The below diagram shows the ideal way to create a dedicated network for IP Voice within your office. 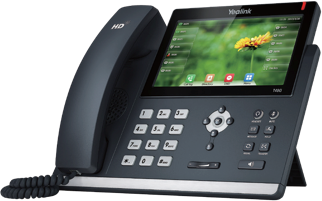 Of course, every office has different networking requirements, involving both your computers and IP handsets, but we can help advise on the best network to accommodate both your voice and data requirements. 1. In order to access the service, you will need a dedicated fixed line broadband Internet connection, such as ADSL 2+you will also need an IP Phone and may need extra hardware depending on your set up e.g. router and switches. 2. We recommend that the Service be accessed with hardware supplied or approved by us, using a broadband ADSL or SHDSL service supplied by us to our specifications. The Service is designed to allow users to bring their own device, but we do not offer any guarantee or assurance that all devices will be compatible and function with the Service. 3. The broadband speed required for the Service will depend largely on your network demands. Data transmission demands on your network may cause the bandwidth available for voice transmission to be limited if voice and data share the same connection. 4. Extra charges will be incurred for freight for any hardware. 5. Minimum 10 DID numbers purchased in blocks of 10. 6. Porting is charged per end user site. We supply the best networks, backed up with our unbeatable personalised service, delivered without any contracts while supporting your local community. We back our level of service with our no minimum term contract guarantee. This gives you the flexibility to change between different plans and services at any time without any fees as well as giving you the comfort that you can switch service providers at any time without early termination fees. Support a local community organisation of your choice by taking advantage of our unique community program whereby we will donate 2% of your total spend to the club or organisation of your choice. We already sponsor many sporting clubs through our community program and are always looking to sponsor many more!